In response to sizeable budget shortfalls, lawmakers have repeatedly cut state spending in recent years. For confirmation, Californians need look no further than CalWORKs and SSI/SSP, the state’s primary safety-net programs for low-income kids, seniors, and people with disabilities. New CBP county fact sheets show that the cumulative impact of cuts made to CalWORKs and SSI/SSP amounts to more than $8 billion between 2008-09 and 2011-12. 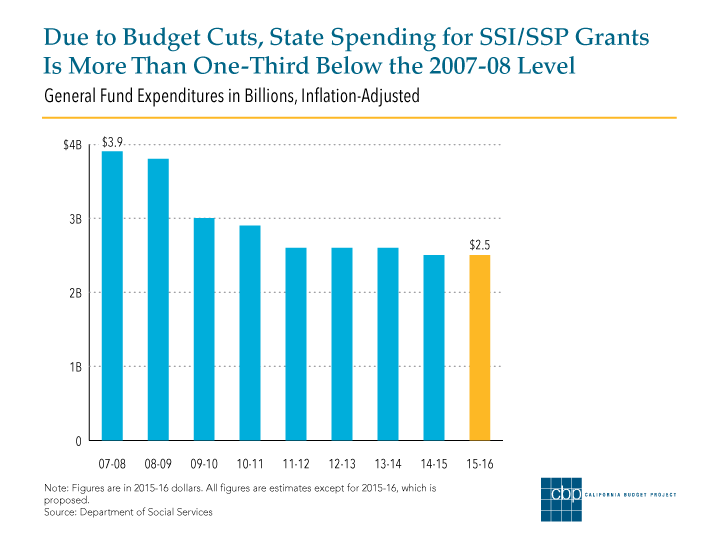 The reduction to CalWORKs during this period – $3.5 billion – is equivalent to a loss of roughly $3,100 for each of the 1.1 million children in the program, while the cut to SSI/SSP – $4.6 billion – equates to a loss of about $3,600 for each of the nearly 1.3 million seniors and people with disabilities who receive cash assistance. As our fact sheets explain, state lawmakers have not only suspended cost-of-living adjustments for cash assistance – a well-worn budget “solution” that keeps grants from increasing to keep pace with inflation – but have ventured into new territory by making deep grant cuts and reversing longstanding policies, including those designed to protect children and help parents successfully move into the workforce. For example, the Legislature cut the maximum monthly CalWORKs grant for a family of three in high-cost counties from $723 in 2007-08 to $638 in 2011-12, an $85-per-month reduction. The Legislature also cut CalWORKs grants by up to an additional 15 percent for many families who receive “child-only” cash assistance, including families in which a parent has “timed off” aid, but the children continue to receive subsistence payments. The loss of funds due to these and other CalWORKs cuts will disproportionately affect California’s high-cost – mainly coastal – counties, including Los Angeles, Orange, and San Francisco, because that’s where more than half (55.4 percent) of CalWORKs families live. Combined, recent cuts have left CalWORKs and SSI/SSP ill-equipped to cope with the ongoing impact of the Great Recession and the challenges of a growing and aging population. California is at a crossroads; a balanced approach that couples recently enacted spending cuts with additional revenues is the only way to preserve the public structures essential to California’s prosperity. Mark your calendars; here’s one not to be missed. Tomorrow at 1:30 in room 4202 at the State Capitol, Assembly Budget Subcommittee #1 will have a hearing titled, “Toll on Californians of Adopted and Proposed Health and Human Services Cuts.” The hearing will examine the impact of last year’s health and human services cuts on Californians, as well as the toll of the Governor’s proposed 2010-11 budget cuts. There will be no public testimony, although the committee will take written comments. The Governor’s administration, its department directors and staff, as well as the Legislative Analyst’s Office, are expected to testify. If you’re not in Sacramento, you can follow audio of the hearing from the Assembly website. It might also be televised on The California Channel. You can, of course, find a multitude of CBP work on these issues. Our recent fact sheets document the impact of the Governor’s proposed cuts to CalWORKs by county and legislative district; to SSI/SSP by county and legislative district; and to the Healthy Families Program by county and legislative district. Last year, the CBP also examined the impact of cuts to the safety net. Two CBP fact sheets released today document the local impact of Governor Schwarzenegger’s proposed cuts to programs that help low-income seniors and people with disabilities meet basic living expenses. The Governor proposes to reduce SSI/SSP payments for individuals and eliminate the Cash Assistance Program for Immigrants (CAPI), which provides state-funded cash assistance to legal immigrants who are not eligible for SSI/SSP due to their immigration status. Our analyses – by county and legislative district – show that the Governor’s proposals would reduce or eliminate monthly assistance for nearly 950,000 vulnerable Californians by a total of $306.9 million between June 2010 and June 2011. This isn’t the first time that these two key safety-net programs have been the target of budget-cutting efforts. Just last year, state policymakers cut the maximum SSI/SSP payment for individuals from $907 to $845 (6.8 percent) and the maximum payment for couples from $1,579 to $1,407 (10.9 percent). CAPI payments were also reduced because they are tied to SSI/SSP payment levels. The SSI/SSP payment for couples is now at the minimum level required by federal law and cannot be cut further, which is why the Governor’s current SSI/SSP proposal only targets payments to individuals. Yesterday, grants for low-income seniors and people with disabilities were cut for the third time this year as part of the state’s effort to close the massive budget gap that consumed policymakers for much of 2009. 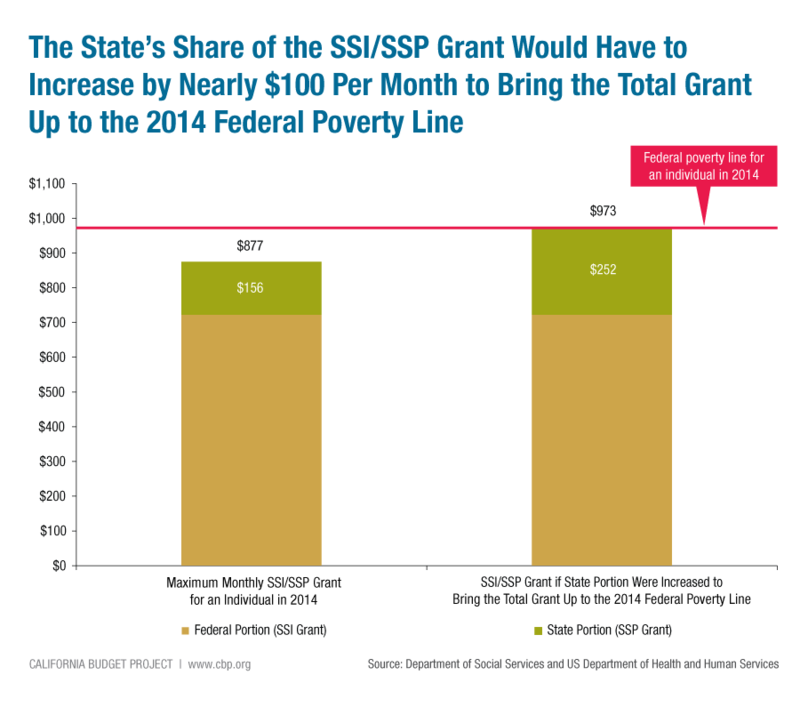 The maximum monthly Supplemental Security Income/State Supplementary Payment (SSI/SSP) grant for couples dropped from $1,489 in October to $1,407 (5.5 percent), while the maximum grant for individuals fell from $850 to $845 (0.6 percent). Combined with previous cuts that took effect on May 1 and July 1, the maximum SSI/SSP grant for couples has fallen by a total of $172 per month this year, and the maximum grant for individuals has declined by $62 per month. The grant for couples is now at the minimum level required by federal law. California cannot cut that grant any further without triggering a stunning penalty – the loss of all federal funding for the Medi-Cal Program. However, the grant for individuals is about $15 above the federal minimum, which could make it a target of future state budget-cutting efforts. Many of the state’s more than 1.1 million SSI/SSP recipients also receive in-home care through the In-Home Supportive Services (IHSS) Program. IHSS recipients got a measure of good news earlier last month when a federal judge blocked the state from implementing service reductions that were included in the July 2009 budget agreement. Those cuts were scheduled to take effect November 1 and would have affected more than 130,000 IHSS recipients. But those weren’t the only IHSS changes included in the July budget agreement. A number of new requirements for in-home care providers were due to take effect yesterday, including new provider enrollment forms, fingerprinting and criminal background checks, and orientation and training. However, county officials testified at a legislative hearing last week that they would not be able to meet that deadline because of the state’s failure to finalize needed instructions, problems with state instructions that had been issued, and other implementation issues. The Assembly Budget Committee may hold a follow-up hearing to sort through more of the details this week, and legislation could be introduced to address the situation.